Our planning process is simple and easy. and reserved in no time at all! Our website provides all the information you need to plan your ceremony and we provided detailed answers most all questions. You could take your time and study our site at your leisure and learn everything about it OR you can fast-track your planning by following our procedure below. We usually have a discount price special for selected packages to low to show on our website. Make sure you us ask about it! - Go to our Prices & Planning Order Form. This is our primary planning tool. - Use the links to find out what you need to know about our locations, professional services, and products. - Fill out the form completely or the best you can. - FYI: We cannot give you a contract price quote until, you fill out all of the required information. If you want a basic cost estimate before that, simply add up the cost of the items you selected. - If it's a straight forward selection and you've given all the required information, we'll make a draft contract for your review. - If we have advice, concerns, or suggestions, we'll email you our thoughts before making a draft contract and we'll go from there. - Make your reservation payment and you're all set. All you have to do is show up! It doesn't get easier than that! Go to our Prices & Planning Order Form. - If your wedding is simple, months away, and you do not require a specific date, time, or location, there's no hurry. FYI: We don't book more than 12 months out. - If you you want a specific date, location, or time, you should get started now and even if it's months away. - If you like us. It doesn’t make sense to wait and let our vendors get booked for other jobs. 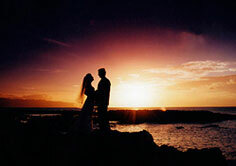 - If your wedding or vow renewal is within 30 days, what are you waiting for? Thank you. You are very helpful. 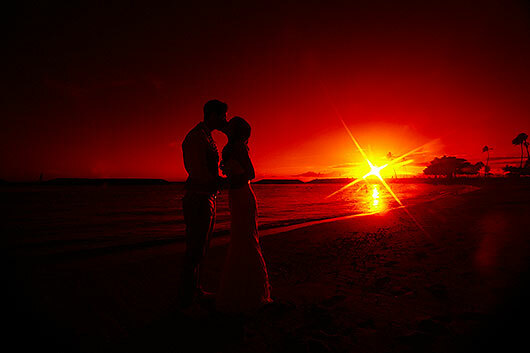 I am just trying to make sure everything is perfect and as you can imagine, it's pretty difficult from Australia - organizing a wedding in Hawaii! Having said that, since you have the experience and clearly I don't, I am just going to put my complete trust in you. I am sure you will do the best that you can. I have been contacting places in Hawaii that advertise weddings for a few months now. You have been the fastest to respond and by far the most helpful. I have given your web address and copies of our correspondence to my travel agent here. She often has people asking her about weddings in Hawaii and she refers them to a company here in Australia that negotiate etc. with people in Hawaii. (At an incredibly expensive rate too). Your excellence has allowed me to show her that there is no need to refer people to an expensive company when they can do the work themselves! So, having said that, you now have the respect of my travel agent and she will be referring others to you. "When you want to get married in a different country, it can be quite daunting to find a company that ‘seems’ trustworthy, knowing that they would be responsible for so much of your big day. It is also difficult to find a company that will be flexible enough to offer the kind of wedding that suits each couples situation. The website for A Hawaiian Wedding was what really spoke to me; the online form presented all of the available options for each part of the wedding, so my fiancé and I could sit down and customise a wedding that actually suited what we needed and could afford, particularly in terms of the photography. During our wedding planning, everyone was very helpful with our questions, and even months later when we called him from Honolulu, in a panic, trying to track down the licensing office, he was able to talk us through the details we needed. On the day, both the photographer and the local minister were very professional and re-assuring, and the photos were amazing! Because the weather and lighting can change quite quickly in Hawaii, we were also very appreciative to have that local photographic experience, and he was able to suggest a variation to our originally planned photo locations, to get the best shots on the day. You did not disappoint! Anyway, thank you for all your help to make our wedding the best day of our lives!"